My family, like many others, writes a holiday letter updating friends and family on the year’s events. You would think that in a whole year’s time, I’d at least have something to write about. This time last year, I found myself literally staring blankly at the Christmas-themed stationery I had created on my computer. – The kids are getting older and doing well in school. – We look forward to next year. Suffice it to say that that letter could have been written by anyone, and that the update was nothing short of generic. Well, I’m happy to say that experience won’t repeat itself this year! Our agency’s tagline is “Celebrating Life Through Travel”. In the new year, don’t just go through the motions. Celebrate life! You don’t have to travel far to celebrate the good things in life. We believe it’s more about the experiences you have and the memories you create with your loved ones. Wherever life’s travels take you, experience every day and every destination in ways that you enjoy and that are meaningful to you. Then you’ll be sure to have something interesting and memorable to write about in your holiday letter! We wish you safe and happy travels this holiday season and throughout the year. I really like this holiday e-greeting I received from Princess Cruises. Check it out for some holiday cheer from around the globe. I received this recipe in a holiday greeting from Viking River Cruises, and it looks so good I had to share it! The year was 1832, and the Austrian minister of foreign affairs, Prince Metternich, ordered his court’s kitchen to create a special dessert for his high-ranking guests. But the head chef of his household was ill that day, so the task fell to his 16-year-old apprentice, Franz Sacher. Fortunately, the delicious chocolate cake he developed on the spot was a rousing success! Herr Sacher went on to become a famous confectioner. In 1876 his son Eduard opened the Hotel Sacher in Vienna, where the treat has been served to honored guests ever since.One of the best things about traveling with Viking River Cruises is the opportunity to sample delicious local cuisine. Here is a recipe from Austria—Sachertorte (pronounced “SOCCER tort”). While the dessert is found in many of Vienna’s coffeehouses, it can also be sampled on many of Viking River Cruises‘ ships. Preheat oven to 375°F. Cream together butter and powdered sugar. Add 1 egg yolk at a time, mixing until creamy. Melt the 5 oz. bittersweet chocolate in a double boiler or microwave; gradually add to the creamed mixture. Fold in flour. In a separate bowl, beat the egg whites and sugar until stiff. Fold into chocolate mixture. Pour batter into a lined 9-inch springform pan. Bake for 50-65 minutes. Remove from pan and cool on a wire rack. Heat apricot jam and smooth over entire torte, including the sides. For glaze, melt the 8 oz. bittersweet chocolate with butter and frost the cake. Serve with whipped cream. XMAS: In Greek, X means Christ. That is where the word “Xmas” comes from! The world’s largest Christmas present was the Statue of Liberty. The French gave it to the US in 1886. It is 46.5 meters high and weighs 225 tons! “Green” Christmas: It can take up to 15 years to grow an average-sized tree of 6 to 7 feet, sometimes as little as 4 years, but the average growing time is 7! Christmas Songs: Bing Crosby ‘s ‘White Christmas’ was released in 1942 and is considered to be the best-selling Christmas song of all time! To celebrate the season, I thought it would be fun to take a look at Christmas and other similar holiday food traditions around the world. In doing so, we’ll pay homage to each of the countries for which we currently offer our exclusive custom culinary tours. 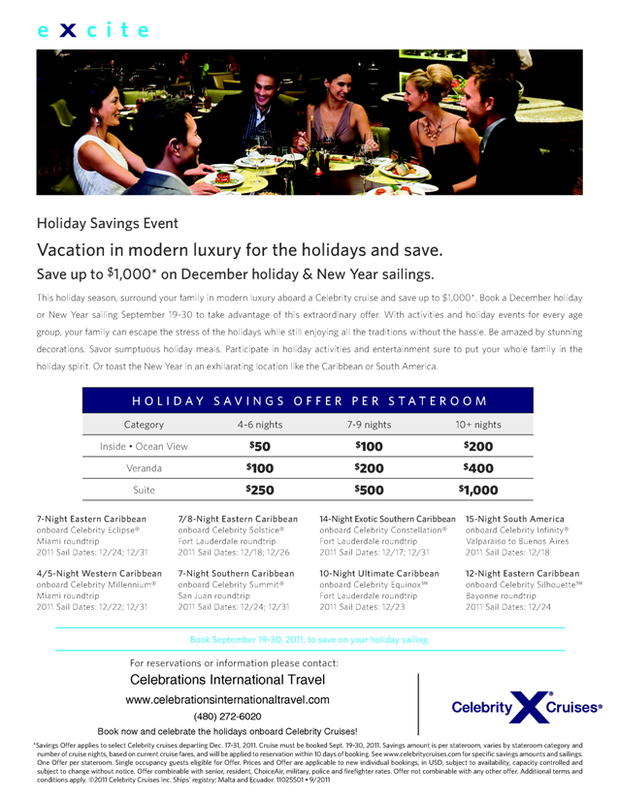 For more information, contact Celebrations International Travel, Inc.
Christmas takes place on December 25th, the summertime in Australia. People often spend part of Christmas day with their families at the beach. Christmas dinner is just as likely to be salads, cold meat and seafood as the traditional meal is roast turkey and plum pudding. Children believe that Santa Claus leaves presents for them under the Christmas tree on Christmas eve. One popular Australian song states that six white boomers, or large kangaroos, pull Santa’s sleigh. Cream butter and sugar. Add eggs, well beaten, also brandy. Stir in all fruit and chopped blanched almonds. Add breadcrumbs, flour, soda, and spices. Bake in greased pudding basin, leaving sufficient room for rising. (The pudding can also be poured onto a piece of calico and tied securely with string.) Steam for 6 hours. This pudding can be made ahead of time, say two or three months if wished. This recipe makes two very large puddings; It is best divided into 3 portions. A half quantity takes 3 1/2 hours to cook. For heating pudding when required, boil slowly for 2-3 hours. Cream butter and sugar, add eggs. Sift in half of flour and half of fruit, mix, then add rest of ingredients. Bake in an 8″ tin 3 1/2 to 4 hours at 300 degrees. Preheat the oven to 150°C, 300°F or gas mark 2 (the temperature is reduced for baking). Beat the egg whites to a foam, add the salt and beat until soft peaks form which fold over when the beater is removed. Slowly beat in the castor sugar, beating well after each addition. Keep beating until the mixture is stiff and the peaks stand up when the beater is removed. Mix together the white sugar and corn flour. Lightly fold into the meringue with the lemon juice. Line an oven tray with baking paper. Spread the meringue into a circle and pipe a decoration around the edge or swirl with a spoon if desired. Bake in a cool oven (80°C or 180°F) for 2 to 2½ hours. Turn off the heat and leave in the oven overnight to cool. Top with whipped cream and decorate with sliced kiwifruit, sliced strawberries, passion fruit, or just about any tropical fruit, just before serving. A biscuit or cookie originally sent in food parcels to Australian and New Zealand troops during the First World War when eggs were scarce, the Anzac (named after the term for Australian and New Zealand soldiers) has become a national favorite. Preheat the oven to 180°C / 350°F / Gas mark 4. In a large saucepan melt the butter and golden syrup, then remove from the heat and cool. Add the white sugar, flour, rolled oats and coconut and mix thoroughly. Dissolve the baking soda in 1 tablespoon of water and add to the mixture. Line a baking tray with cooking paper. Roll small rounds of the mixture and place on the baking tray, remembering to allow room for the biscuits to spread. Flatten with a fork. Bake for 15 minutes or until golden.